In the 1980s, with the wounds of the Vietnam War still fresh in the collective American memory, Hollywood took up the themes of empire, democracy, and war. A series of films transported Americans to distant countries and exotic locales where small and bloody conflicts of the cold war were being fought. Ronald Reagan had called the Soviet Union the “Evil Empire.” The focus of U.S. foreign policy had turned to a handful of Latin American countries where right-wing dictators waged war against leftist rebels. In response, filmmakers raided studio wardrobe closets for the uniforms of foreign armies and their gold-braided epaulets; and they lined up Latino actors to play banana republic strongmen and right-wing hit men. For Salvador (1986), dozens of actors were hired to portray the tortured corpses of El Salvador’s recent history, and Nick Nolte and Gene Hackman paired up to tell a story about the revolution against Nicaraguan dictator Anastasio Somoza in Under Fire (1983). These films borrowed heavily from the narrative formula mastered decades earlier by British writer Graham Greene. In novels such as The Quiet American, Our Man in Havana, and The Comedians, Greene tossed idealistic and cynical Westerners into the absurd theater of third world political conflict and imperial intrigue. Salvador and Under Fire offered up American journalists as protagonists, as did other political thrillers of the era, such as The Year of Living Dangerously and Missing (both 1982). In 1983, filmmaker Gregory Nava, with his writing partner and producer, Anna Thomas, also brought the story of a cold-war battleground to the screen. They shared the moral outrage that marked the works of their brethren working in Hollywood, but their film was made under very different circumstances, and with a very different narrative, if not political, point of view: the independently produced El Norte explicitly rejected the Graham Greene formula and told a story in which politics was secondary to a universal (and ongoing) human drama. Moreover, Nava and Thomas made a courageous decision: they told the story entirely from the point of view of the colonized “natives,” eschewing an English-speaking protagonist. Guatemala was then suffering through what was arguably the most sanguinary of all the late cold-war conflicts fought in the Western Hemisphere. Nava filmed much of his movie in Mexico because Guatemala was then ruled by the military dictatorship placed in power by a CIA-orchestrated coup d’état in 1954. In the 1980s, in response to growing militancy among Mayan Indians, the Guatemalan army launched a scorched-earth policy in the country’s Mayan-speaking regions. Entire villages were wiped off the map: it was the closest thing to genocide in Latin America since the Spanish conquest. These acts of rebellion and repression are the backdrop of the events depicted in El Norte, which is the family drama of Enrique and Rosa Xuncax, the earnest brother and sister whose flight from Guatemala’s violence becomes a grand, cross-border epic. There isn’t a word of English spoken for almost the entire first hour of El Norte. Instead, Nava’s fine ensemble of Mexican, Central American, and U.S. Latino actors speak the K’iche’ Mayan language and Spanish with well-practiced Guatemalan and Mexican idioms and accents. Even the beer served at the table of Rosa and Enrique’s village home is a real Guatemalan brand, as Nava brings to El Norte a unique blend of authenticity and dream realism. Nava’s dreamlike imagery, though, is grounded by a realistic brutality. The violence that falls upon the family after the act of defiance by Rosa and Enrique’s father, Arturo, rings with truth: tens of thousands of Guatemalan families suffered similar fates. 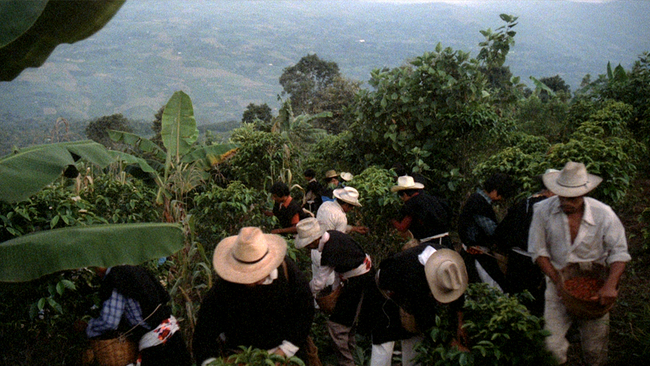 The Guatemalan chapter of the film ends with the arrival of soldiers, and an act of brutality as gruesome as anything in Salvador or Under Fire. But what gives Nava’s remarkable film its lasting power is what happens from that horrific moment onward, as Rosa and Enrique undertake a journey northward that parallels that canonical American tale of desperate people in flight: The Grapes of Wrath. “In the North, we won’t be treated this way,” Enrique says. “We’ll make a lot of money. We’ll have everything we want . . . We’ll have good luck now. I’m sure of it.” “The North” is his only hope for salvation, and he clings to the faith that the myth might actually be true. But the Xuncaxes soon discover that the road north is a kind of “war” in itself. On the route from the lush mountains of Guatemala to the deserts of northern Mexico, they encounter helpful strangers, smugglers, thieves, and an unrelenting sense of strangeness and threat. Rosa and Enrique pass underneath the U.S. border in an abandoned sewer drain and are attacked by rats, a powerful metaphor for the dehumani­zation inflicted upon everyone who undertakes such a crossing. Rosa and Enrique’s first look at California is of the gleaming lights of the San Diego skyline. It’s a modern, urban version of the green fields of abundance the Joads gaze upon after crossing the Mojave in The Grapes of Wrath. Like the Okies and other down-and-out migrants who arrived in California before them, Rosa and Enrique will soon discover that California is at once a place of magical reinvention and cruel exploitation. Enrique looks for work at one of the infamous day-laborer sites that dot Los Angeles. He eventually finds a job at an upscale restaurant: when he sheds his scruffy clothes and dons a white busboy’s uniform, he is transformed into a beaming prince. Rosa evades capture in an immigration raid and finds work in an orderly mansion much like one she admired in a Good Housekeeping magazine back in Guatemala. Brother and sister study and quickly master the lingua franca of all ambitious Californians: English. But the Xuncaxes’ fragile hold on the American dream quickly slips away in the final, tragic half hour of the film. We are left with El Norte’s deeply subversive message: the ligatures that bind us to the suffering and violence of the third world are everywhere to be seen in our daily American lives. We are surrounded by people whose flight from their homes ensures the comfort we enjoy in our homes. Nava’s triumph is that he succeeded in placing the courage and dreams of people like Rosa and Enrique at the center of his story, rather than making them mere extras in the background of an exotic political thriller. And he foresaw what would become a defining fissure in America’s social fabric: the marginalization of millions of Latino immigrants. Just a few years after the stories of Central America began to reach U.S. movie screens, the Berlin Wall came crashing down and the cold war fizzled to an end. Military men no longer dominate the El Salvador of Oliver Stone’s film or the Chile of Missing or the Guatemala of El Norte. At the same time, the continuing arrival of immigrants at the U.S.-Mexico border has grown into a central issue of the American political debate. The perils of the migrant road northward haven’t changed all that much in the quarter century since El Norte’s premiere. The border is officially “militarized” now, and the crossing routes have moved deep into the Arizona desert. For most people, the journey remains as awful and degrading as a long crawl through a rat-filled tunnel. Nava filmed El Norte, in part, with funding from U.S. public television. Back then, there was no Fox News or powerful anti-immigration lobby to complain about American tax dollars paying for a film sympathetic to the undocumented. And although PBS has continued to put forth inspired works about immigration issues, a “compassion fatigue” toward immigrants has spread generally through American society. Poverty and corruption continue to feed social conflict in Latin America and out-migration to “el Norte.” Cities and towns from Montana to Maine are filled with Rosas and Enriques, and Latino immigration has transformed the cultural fabric of the United States. Today, El Norte endures as the epic chronicle of a journey deeply embedded in the American experience. Héctor Tobar is the author of the novel The Tattooed Soldier and the nonfiction book Translation Nation: Defining a New American Identity in the Spanish-Speaking United States.